Cu-fasaich Coisiche Dooidhche; John-Luke Edwards PhD., Ceann-Iuil; Initiated Pathfinder and Seanair; Elder of Sagh’ic Tire Dhream, in which I hold the Traditional Title of Ciar-Sùil à Dorchar Cuchair (Eyes of The Dark Hunter). It is my sacred role and duty to lead the Elders in researching, dreaming and re‑instigating through the Egregore, the Animist Lineage Tradition Sagh’ic Tire Dhream. The Sagh’ic Tradition founded the Sacred Circle of the Great Mystery Society of which I am Presidor. This Animist Society is founded to create, maintain and encourage a Spiritual Community and Network of many Animist and traditions and families of Spirit, focussing a path of work in the support of the Earth as the integral being of which humans are a part. It has been my privilege and honour to have worked supporting those caught in the drama of abuse and abusing, working with victims, survivors and perpetrators of sexual abuse. Working with the gifts of the spirits my journey included also working as a Spiritual Director, Retreat Facilitator, Aids Counsellor and Loss & Grief Counsellor, a tutor of Counsellors and Psychotherapists, and working with Canadian First Nations. It is a great joy to be the co-presenter with Jeff Stockton, of the Forked Stick podcast, which reflects on and discusses issues of Spirit and the Earth with teachers and practitioners of spirit, worldwide. It is my belief that the issues in our lives, which betray our destiny, fall out of our fear of Divine loneliness that manifests in a dysfunctional relationship with our soul song and ourselves. This relationship yearns for ‘completion’; this yearning and dysfunction become reflected in all our external relationships. In terms of the Sagh’ic, we forget the Song of our Souls and that silence creates this disconnection with ourselves, others, and the Earth and all Her Children. I hope that my approach is to be a catalyst in the transformation and emergence of truth in the relationships those that seek me out have with themselves and their souls; by this to return to that first harmonic intention of the stars, which we are all born, to and for. 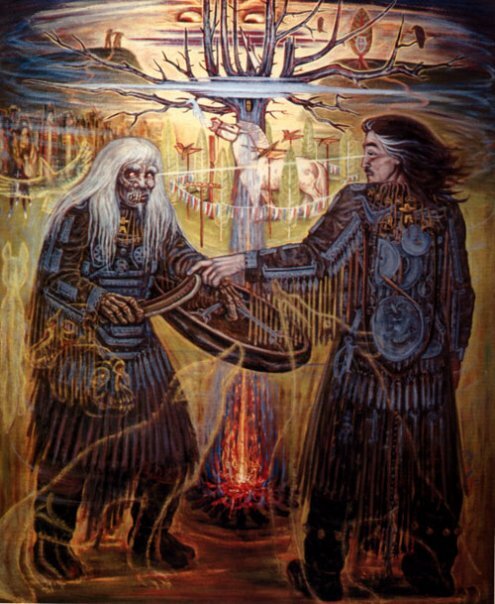 Through the Sagh’ic Tradition I have avowed to be of service to the Ancestral Spirits, The Ancient Ones and to the best of my abilities, to the Children of Our Mother, Màthair Tei, The Earth. My greatest fear is that I will die and not be in service.